As I was at work browsing the blog feed on WordPress I came across a video a young lady made about the negatives of being natural. Anything you do has it’s pros and cons, even being natural. But making a video about discouraging people to not have healthy hair just didn’t sit to well with me. Now there is nothing wrong with relaxers I have my days where my hair frustrates me and I have to go to the store and stand in front of a few relaxer boxes to remind my hair I can go back anytime to get some act right out if it!!!!! Lol. Most of the videos, blogs and pictures you see make it seem so easy. But being natural takes work and patience. Believe me I don’t have a smile on my face standing in the mirror doing twist outs or Bantu knots giving my arms a break every now and then because it’s so much hair most times I just want to go to bed! Transitioning for some is the hardest because you have to figure out your hair type, what your hair likes and how to keep it moisturized, avoid breakage, shedding, split ends, no growth, hair pH and reading the labels on hair products to make sure you aren’t putting anything damaging in your hair. 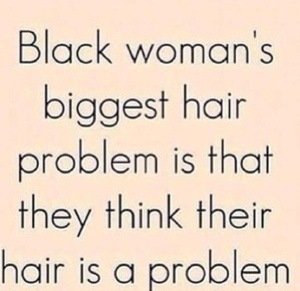 (This also applies to people who’ve been natural for awhile as well). Face it ladies your hair is a science experiment and you’re just going through the scientific method trying to figure out what is what and how to. Seems like a lot right! Don’t fret that’s why there are blogs and YouTube videos of people who have already gone through most of these stages to help you get through it….. Anything worth having doesn’t come easy and having healthy hair is worth it. This entry was posted in E's Essentials and tagged natural hair. Reblogged this on Blossomed Roots.